Cucumbers grow well on soils with high humus content, good structure and water retention capacity. Sandy and slightly acidic soils are also ideal for cucumbers, but good watering capacity is essential. Cucumbers quickly develop an extensive root system to absorb the large amounts of water. Two weeks after sowing, it is already well developed and very efficient. 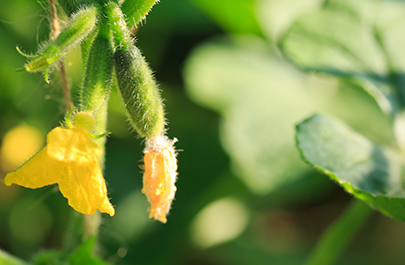 Cucumbers love warmth, but too high temperatures and strong fluctuations between day and night reduce flowering, fructification and even fruit growth. In areas with high humidity and water-logging with mist formation, special attention must be paid to foliar diseases (powdery mildew). Ensure adequate nitrogen and phosphate supply at the beginning. Emphasise potash fertilization from the beginning of harvest. The calcium and magnesium requirements are important. Cucumbers are among the oldest cultivated vegetables. Similar to tomatoes, they cannot tolerate rain, as the leaves rapidly become sick and the fruit can rot. Nevertheless, they regularly need a lot of water because they only have a shallow root system. Despite the temperature requirement, outdoor growing of cucumbers in particular for preserving cucumbers has proved successful in favourable locations. However, these are concentrated around the processing companies for preserved foods which are thus climate limited. Salad cucumbers are produced almost exclusively in protected cultivation under foil or glass. The yields are more than twice as high as in open field cultivation. 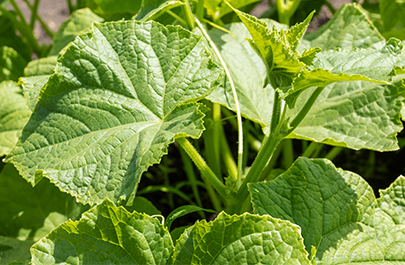 Cucumbers are susceptible to mildew and viruses like all plants in the pumpkin family. Varieties with resistance and/or tolerance to individual diseases are advantageous. Cucumbers need a lot of nutrients and balanced fertilization. As a nutrient-depleting fruit, cucumbers need a lot of nitrogen. However, excessive amounts of nitrogen can increase the susceptibility to diseases. Cucumbers also have a constant demand for high volumes of water. They also need large amounts of potassium. Due to the continuous plant growth and the simultaneous formation of flowers and fruits, a balanced supply of nutrients is a challenge for the plant. Cucumber fertilization must consider the constant growth of new shoots, leaves, flowers and fruits, and on the other hand, the already growing fruits for optimal ripening. Excessive amounts of nitrogen in this phase can cause poorly formed fruits and a bitter taste. The amount as well as the composition of complex fertilizers must therefore be adapted to the stage of development of the cucumbers. The table shows the uptake and withdrawal per tonne of cucumber yield. According to this, cucumbers mainly need nitrogen and potassium. Phosphorus and magnesium must also be present in appropriate amounts. For example, a cucumber yield of 200t/ha takes up 400kg N/ha. If 40kg N/ha are supplied by the soil, then 360kg N/ha would need to be fertilized. If grown outdoors with a fruit yield of 60-100t/ha and 20t plant mass, the following quantities of nutrients per hectare must be assumed: 145kg N, 55kg P2O5, 220kg K2O, 325kg CaO, and 55kg MgO. Under suitable conditions, high-yielding cucumber stocks are expected to produce 200 tonnes per hectare. While the fruit ripens on older parts, the plant continues to grow. Fertilization should therefore support sustained growth and at the same time allow fruit with high market value and good taste to ripen well. The nitrogen supply must be sufficient as long as the growth continues. Phosphorus and large quantities of potassium enable high quality (taste, colour, firmness and shelf life). The provision of enough potassium is essential for fruit formation and fruit enlargement. However, is important to avoid an excess of nitrogen as it increases susceptibility to foliar diseases and fruit rot. Furthermore, too much nitrogen can affect the quality and the fruit can develop a bitter taste. Cucumbers are very sensitive to chloride. Fertilization with potassium chloride is therefore only possible in autumn before cucumber planting. In the growing season, potassium sulphate is the better choice. Cucumbers are also sensitive to salt. Iron deficiency is best counteracted with leaf fertilization of iron chelate. Splitting the applications is absolutely necessary. If grown in the field, some fertilizer is spread before laying the mulch film.The rest is fertilized in several doses according to demand, partly only in the row. Calcium should be applied in autumn before planting. Magnesium-emphasised limestones (2,000kg CaO/ha) may be used. In protected cultivation, fertigated soil or substrate culture is at the cutting edge. On the one hand it is possible to use different fertilizers at different growth phases, on the other hand the nutrient quantities can be adapted according to demand, vegetation progress and harvest quantities. The amount of shoots per m² and continuous production of flowers and fruits determine the yield. 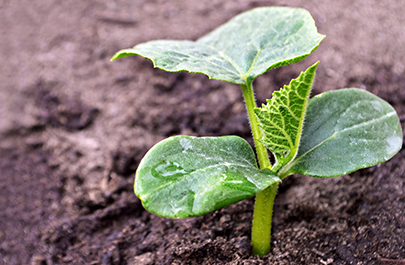 After planting and at the beginning of growth, cucumbers need relatively little fertilizer. Meagre fertilization and restrained irrigation increase root mass formation. Therefore, only about 10% of the nitrogen, 7% of the potash, and 40% of the total phosphorus are provided until the first flowering. An NPK compound fertilizer with a low N content is suitable for this fertilization phase. Flowering and fruit formation have to be promoted at the same time. Therefore, particularly balanced nutrient ratios are necessary. During this phase, fertilization is high in potassium. Magnesium and calcium supply must also be taken into account. Application of K-heavy NPK fertilizer from the start of harvest until the end of cultivation. The harvesting phase has the highest nutrient requirements. High amounts of nitrogen, phosphate and potash are necessary. A continuous dosage of nutrients through irrigation (fertigation) with suitable L.A.T SUPREMO products ensures the supply. Poorly formed fruits with a bad taste are the result of of inadequate fertilization. In addition, undersupply is also evidenced by poorer new flower formation and the resulting reduced yield. Cucumber fertilization can be stopped approximately two weeks before the end of the harvest. The last fruits then ripen with the nutrients still present in the plants.